​Every pet owner out there wants to take the best possible care of their little pet, whether they have a hamster, a dog or a fish. ​However, it can be REALLY hard to figure out what the do’s and don’ts are, when it comes to hamster care. And in today’s post, I’m going to show you exactly how to give your hamster the attention and love it deserves. ​We’ll dive into the details below, but we also put this info into a hamsterific infographic. Why is cage size important? Your little hamster will spend more than 23 hours each day in its house. For that reason, it should be no surprise to see “a properly sized cage” as one of the basic hamster rights. However, figuring out what constitutes a proper size for a hamster cage can be hard, and unfortunately, hamster cages that are simply too small are also being sold. Further, someone will use a fish aquarium for a hamster cage, and while that can be okay, most are unfortunately too small. And thus, by no ill will a well-meaning hamster owner might be violating the rights of the beloved pet. 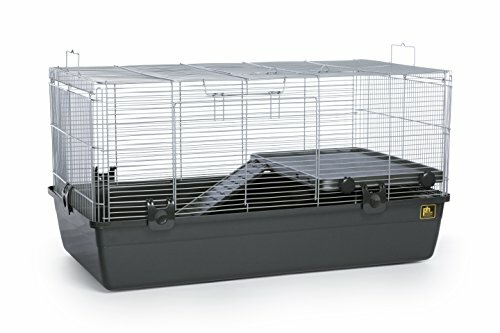 The minimum size of your cage naturally depends on the type of hamster you have. Generally speaking, there are two types of hamster and it’s important to know which one you have. The Syrian Hamster (or Teddy Bear Hamster) is of the larger hamster variety. It is approx. 6-7 inches long (15-17 cm) and weighs 5-7 ounces (140-200g). Dwarf Hamsters are, as you have probably guessed, smaller than the Syrian Hamster. There are four kind of dwarf hamsters (Campbell’s, Winter White, Chinese and Roborovski Hamster) ranging in size from 2-5 inches (5-10 cm) and weigh between 1-2 ounces (25-50g). Once you have determined the size of your hamster, here are the cage guidelines to follow, but remember, bigger is always better! 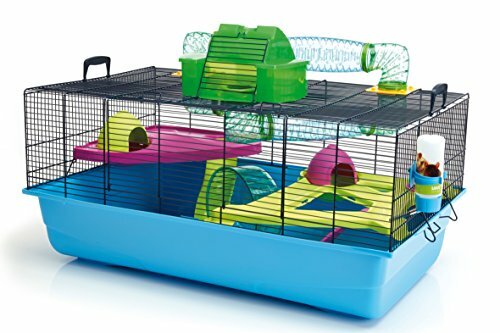 For a Syrian Hamster you need a large hamster cage with a floor space of at least 360 square inches (2,300 square centimetres) and a total area of 2 cubic feet (55 litres). The space between the bars should not be more than half an inch apart (1cm). The Syrian Hamster should always be kept alone. 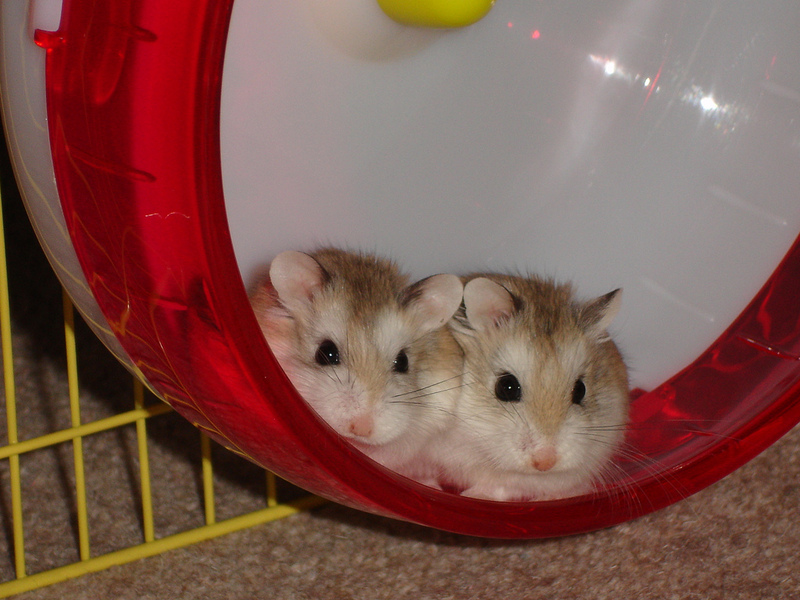 Dwarf Hamsters are more active and have the same requirements. For each dwarf hamster you add, you should double in size. For dwarf hamsters, it is best to get an acquarium so they do not squeeze through the bars. Remember if you want Dwarf Hamster’s to live together in the same cage, you should introduce them to each other at a young age. Why is a hamster wheel important? In the wild, hamsters live in underground burrows where they sleep, raise families, hide from predators and gather food. They gather their food at night and they travel long distances to do so. In fact, it is not uncommon for hamsters to run 5 miles at night in the wild to gather the precious food. Whether hamsters run as much in captivity is doubtful but they still have a lot of energy to burn and its integral for your hamster’s happiness that it has a proper wheel. 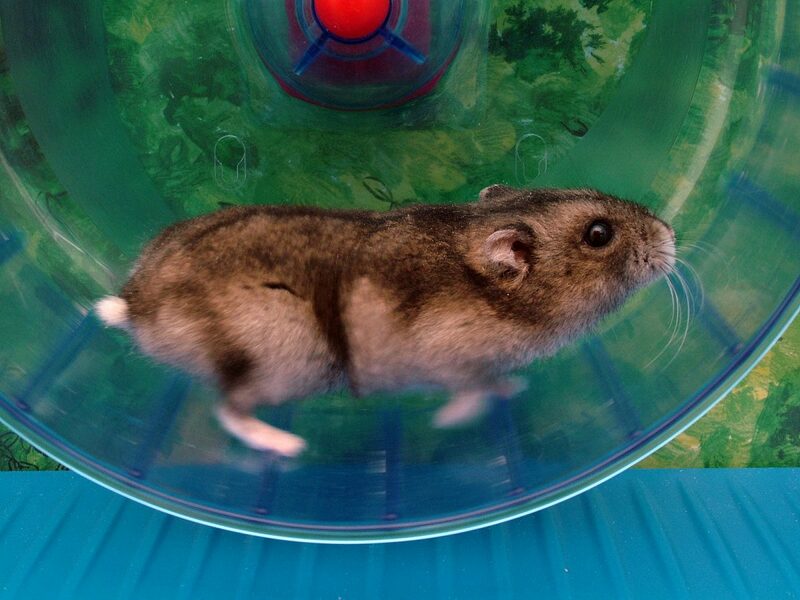 Quite simply, if you don’t have a wheel, your hamster will get stressed due to a lack of things to do. When you are buying a hamster wheel, the single most important factor is to get a properly sized wheel. Not surprisingly, the larger your hamster, the larger a wheel you need. 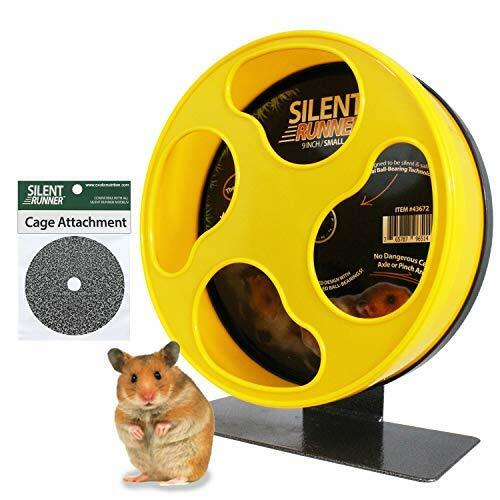 Remember: As with cages, hamsters generally prefer larger wheels to smaller wheels. Further, the above are the general minimum requirements and they do not work for all hamsters. Running with an arched back is very bad for a hamster’s health. Not only does it damage its bone structure running on a smaller wheel, it will also enjoy it less, run less and thus have a worse overall health situation. On the picture below, you can see a decently sized hamster wheel. Contrary to metal wheels, plastic wheels are made of one piece which is moulded together. There are a variety of both open and more enclosed options you can get and both work fine. Safe, solid running surface with no pinch areas. Textured running tracks for non-slip, excellent grip. Includes Cage Attachment for mounting. Made without a center axle, so no risk of spinal injury or tail / fur entanglement. Natural bean-shaped openings for safety and containment. Pet-preferred solid black walls. Why does a hamster need something to chew on? We’ll start with a (for many) surprising fact about hamsters: Their teeth are constantly growing! Because of this, your hamster need something to chew on, otherwise its teeth will simply grow too large. 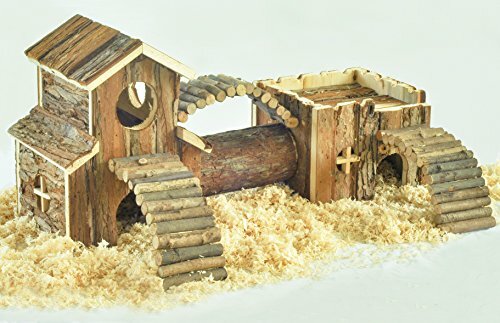 At the pet store, you can get wooden pet toys that your hamster can chew on. In addition to wooden chew toys, cardboard is also great. When using cardboard make sure to use a chemical free variety. We do not recommend getting plastic toys for hamster. This is due to the risk of your hamster gnawing plastic loose and digesting it. Besides the obvious health effect of chowing toys on their teeth, these toys will also provide a fun activity for your hamster, which again will help with the stress level. If you want inspiration on how to implement these things into your hamster cage you can check out this great video below. Tower, tunnel and various climbing opportunities. Do I need to clean the cage every week? Let’s start by taking a step back and consider this: Hamsters have relatively high hygiene standards and they will routinely groom and clean themselves, in the same way a dog does. However, one thing the hamster simply cannot do is cleaning its cage – that is up to you to take care of. And yes, you should do this every week. The hamster does everything in its cage – it plays, it sleeps, it drinks and yes, that naturally also includes all its number 1’s and a 2’s in the cage. Normally, it will take 15-20 minutes to clean the hamster cage depending on the size of the cage. Remove all toys and supplies. Ideally you should sort these in two piles with the first being things that go back into the cage, and the other being things that don’t. The things that go back in the cage should not be cleaned, otherwise the hamster will get confused by it not having the familiar smell. Remove all the bedding from the cage. Again, you sort into two piles and I generally throw 75% of the bedding out and retain 25% of the bedding. This is also to retain the familiar smell in the cage. Give the cage a good wipe down with a damp cloth. If your hamster has been sick during the last week, it is a good idea to use safe pet disinfector to prevent the hamster from getting sick again. Wait half an hour for the cage to dry properly. Mix the old bedding with the new bedding, and place in the bottom of the cage. Let’s start by asking a question: Would you have a cat or dog and not give it food or water every day? If you’re in doubt, the answer should be no – you would change it every day. Just because a hamster is smaller and lives in a cage doesn’t mean the same rules do not apply for it – you should give your hamster new food and water every day. Doing this will also allow you to do something else: Monitor the habits of your hamster. If your hamster’s appetite for food or water suddenly drops it could be a sign the it is sick, giving you a hint to take extra care for it in the coming days. Also, it tells you that you should disinfect the cage during the next cleaning. If you’re all set with your routines you can skip ahead to #6, otherwise I recommend you read this. While it is simple to give food and water to your hamster, there are a couple of things to remember. As for water, you have to decide between getting a water bowl and a water bottle. Some hamsters will use the water bowl as their toilet! When using a water bottle, remember to check the spout periodically to make sure water still flows easily through the spout. The spout should be in a position where the hamster bends it neck downward to an almost horizontal spout. For more about hamsters and water I recommend checking out the video below. 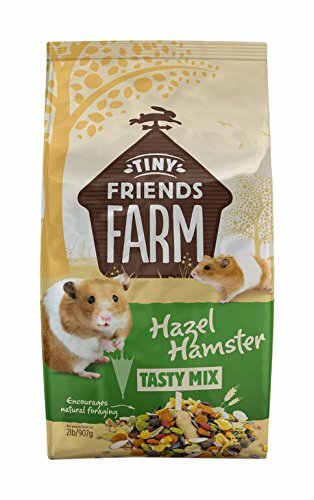 To put it in very simple terms, hamster diet differs from that of other animals so you should not tempt fate by buying dog, rabbit or other types of food – your hammy needs hamster food! By nature, the hamster is omnivorous (just like humans), that is they eat both plants and meat. In their natural habitat, a hamster diet would consist of seeds, grasses and a few insects. When you decide on what hamster food and treats to buy this should naturally be reflected. And while you do not need to feed your hamster insects the best hamster food will contain some protein to mimic this. What type of hamster food to get? First of all, we would like to make the point, that you should be buying natural hamster food without any additives. Unlike food for us humans, hamster food does not go through a rigorous FDA testing. Thus, the easiest way to ensure you don’t feed your hamster anything bad is to buy food without additives. Historically, seed hamster food has been the main and only choice of hamster food. While it can and often is okay to use, it does risk your hamster being picky only eating its favorite seeds. This will lead to a diet that is not balanced and worse, your hamster will not get all the vitamins it needs. Thus, if you go with seed hamster food, make sure to monitor your hammy’s habits and make sure the food bowl is empty before giving it more food. Otherwise, its diet will not be sufficiently balanced. Because seed hamster food requires some monitoring, pelleted hamster food is generally seen as a better option. In it, everything is mixed together so every bite your hamster takes is balanced. What does pelleted hamster food like? Pelleted food usually looks like small biscuits, cookies or cereal or simple cubes as in the picture below. What is pelleted hamster food? 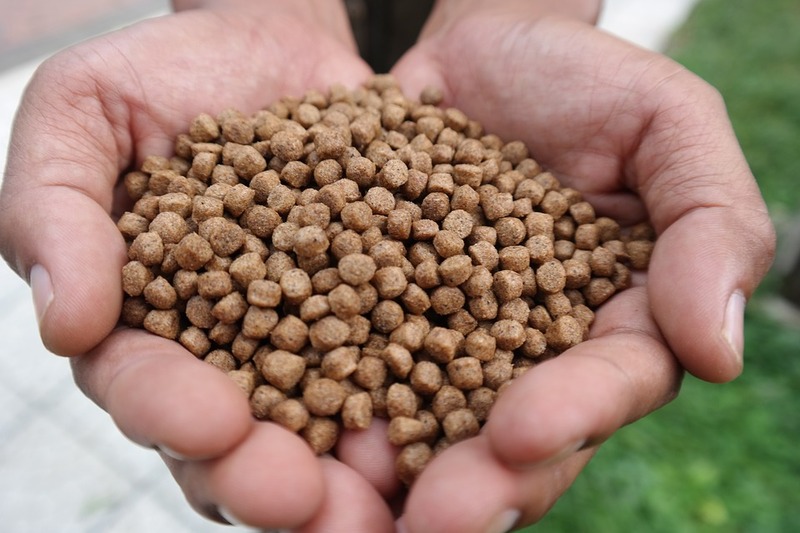 Pelleted foods are a recent innovation in animal nutrition. The basic premise is to give your hamster the optimal nutrition in an easy-to-eat, easy-to-serve format. Each pellet (or nugget), contains a baked, healthy blend of grains, seeds, vegetables, fruits, proteins, vitamins, and minerals. As pelleted foods are also specifically made for other animals such as birds and rabbits, it is important to buy pelleted foods specifically for hamsters. As hamsters love and crave variety, it is a good idea to supplement its diet with treats and snacks. Here we have listed 22 common snack household items for hamsters. … and as already mentioned they can be really active during the night and run many miles. Usually a hamster starts being active late in the afternoon or early evening and will have gone to bed when you get up in the morning. If you have small children that likes to pet the hamster, it can thus be hard for hamster and child to meet daily. … however, they will most likely not do this too often, as an awakened hamster is usually a grumpy hamster that can and will nip / bite a human. While a small pinch for most adults, this can be somewhat unpleasant for small children with soft skin. Why are hamster so sensitive to loud sounds? I am sure you have been startled by a loud sudden sound, whether it be kitchen pots falling behind your or turning on your car for the radio to blast out it max sound. Now imagine you had a much better sense of hearing. That is exactly what hamsters have, which they again have in common with dogs. Because of their amazing hearing, what is pretty loud to you is deafening to hamsters and listening to loud music in your hamster’s room is tantamount to hamster torture. 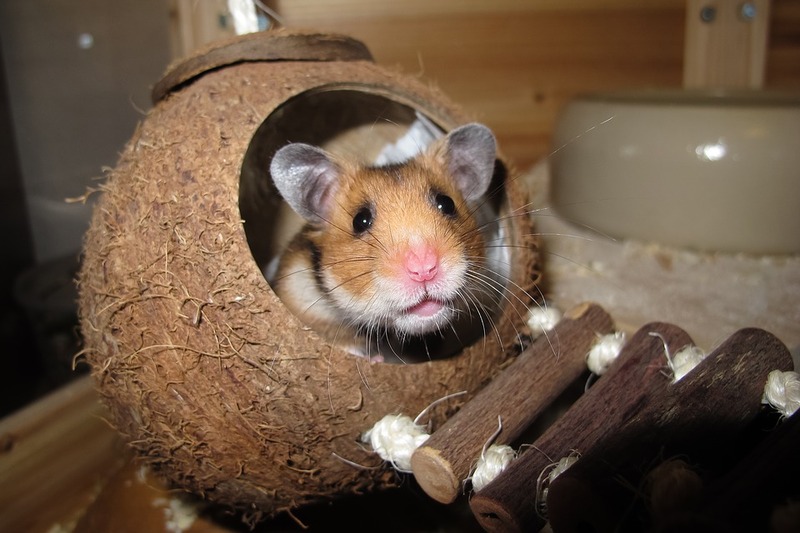 Further loud noises and music will not only lead to your hamster holding its ears while the music is playing – it will also increase its stress level which in the extreme case, could lead to the feared hamster disease, wet tail, which is often fatal. We mentioned it earlier and would like to re-iterate it: Never keep male and female hamster together (no, not even for short periods). 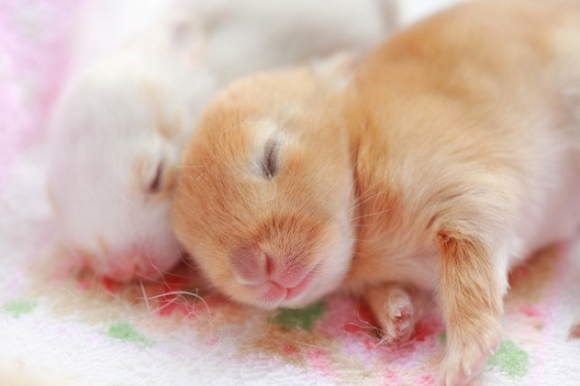 Hamster multiply at an amazing rate and females can give birth to more than 100 babies in a year! … otherwise, it might prove fatal for your little baby hamsters. Most important of all is not touch the baby hamsters. Having given birth, the mother will likely be aggressive to any intruders and may act aggressive towards you. Although not stressing the mother is a good enough reason not to be inside the cage, there is a far more important reason. 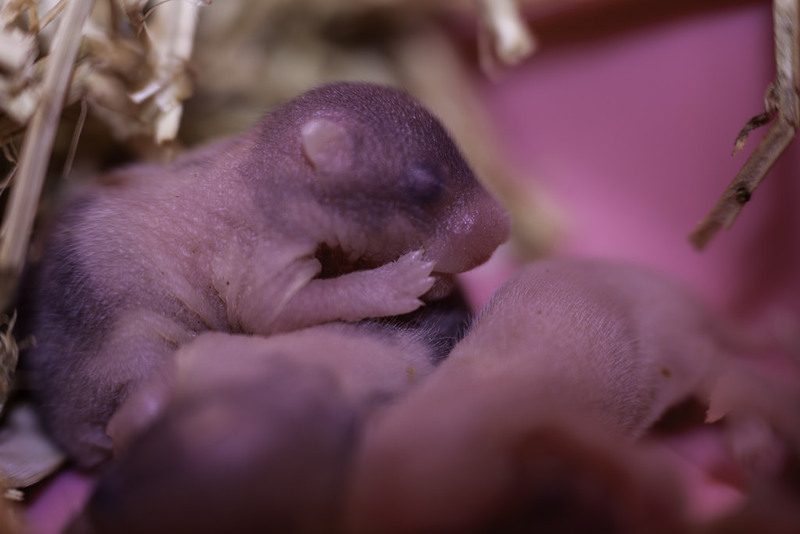 If you go inside the cage, your scent may catch on to a baby hamster. Should that happen, the mother is likely to reject and abandon her babies, or outright kill them. Naturally, you should not clean the cage during this time and of course, neither should you try to handle the babies. This might go against your instincts. After all, they look so small, blind and helpless. However, we really can’t stress how important it is that you do not try to do anything. If you see a baby hamster outside the nest, mama hamster will go and retrieve it once she realizes it has gone onto its own adventures. Do I need to play with my hamster every day? Many hamsters require social time with their owner at least once a day for 5-10 minutes and should be given more attention at least a couple of times a week. 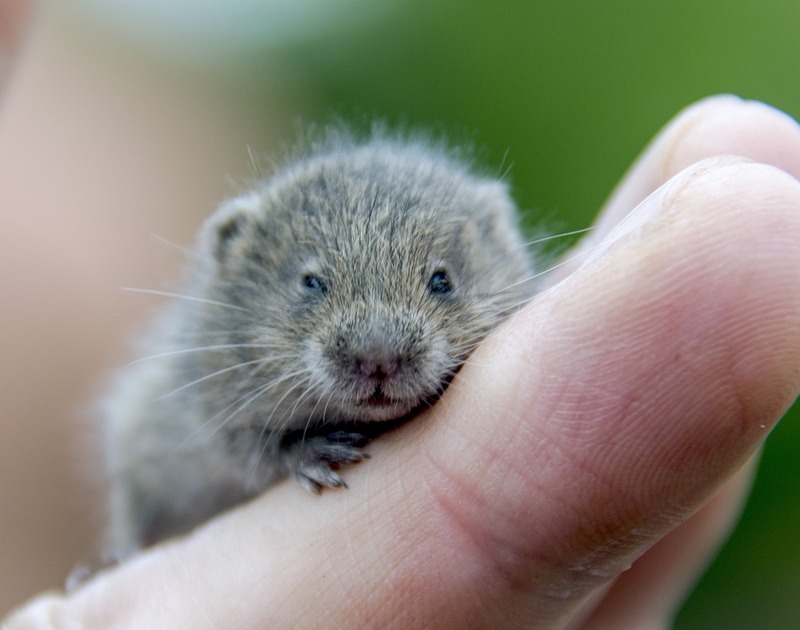 … that is, if you like the rest of us can’t get enough of adorable squishy faces and cuddly critters. Naturally, given that your hamster is nocturnal it is best to play with it at night-time. That way both you and your hamster get the best out of each other. During this time, you can play with your hamster both inside and outside of its cage. … and outside you can handle the hamster it and do their favourite thing in the World: Being rubbed on their belly. If you need more inspiration for playing with your hamster you can check out the video below, containing tips on how to train your hamster to do tricks. If you are prepared to live up to the 10 Basic Hamster Rights, you are ready to have a hamster. And if you get one, you’ll likely figure out that this is just the tip of the iceberg and there are so many more things you can do to make both you and your hamster bond and have a great relationship. If you have any questions please don’t hesitate in leaving a comment below – we’ll be around to answer them. Previous Post Baby Hamster: 8-Step Guide to Hamster Babies Next Post Best Hamster Food: What do hamsters eat? 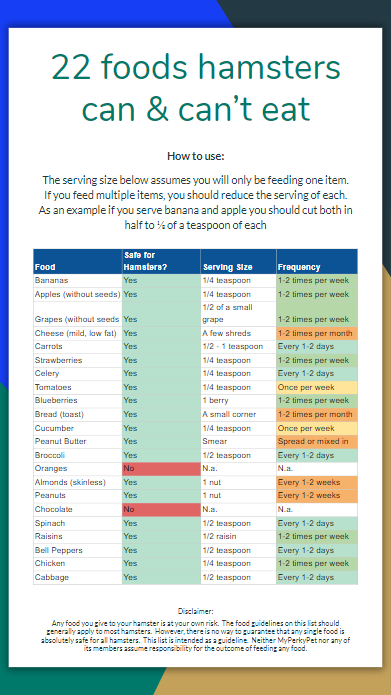 Get our color coded list of safe snacks for your little hammy!